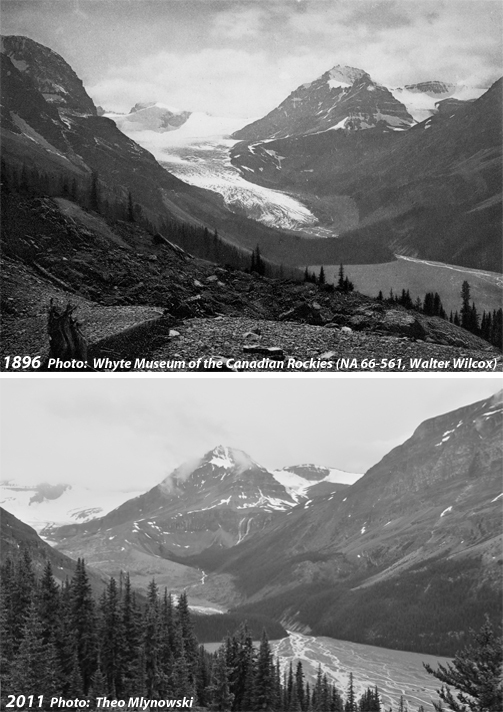 Peyto Glacier from near the current Bow Summit viewing platform in 1896 and from the current viewing platform in 2011. Peyto Glacier has receded and thinned markedly since 1896 and is now almost completely out of view from the Bow Summit viewing platform. The 1896 photograph was taken by Walter Wilcox and is used here with permission from the Whyte Museum of the Canadian Rockies. Thanks to Theo Mlynowski for contributing his 2011 photo!